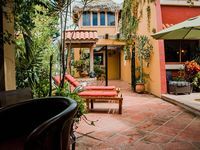 AMAZING 5-Star Villa Resort at Emerald Bay Mazatlan-- private pool and carport! 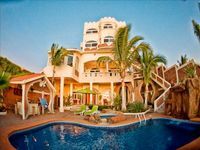 Property 15: AMAZING 5-Star Villa Resort at Emerald Bay Mazatlan-- private pool and carport! Enjoy The Best Christmas Vacation Ever In Your Own Luxurious Mazatlan Villa! Property 16: Enjoy The Best Christmas Vacation Ever In Your Own Luxurious Mazatlan Villa! It's Amazing! You need to stay here! I can&rsquo;t say enough about what a wonderful stay we had at this amazing human Sandcastle. The place is extraordinary! 10 of us stayed for 6 nights to celebrate my 40th birthday. Rafael and Cindy were amazing! They helped make our stay very easy, hospitable, and enjoyable. Lionne and Lori were also very helpful in finding and arranging things for us to do. They were prompt with communication, and we felt the costs were fair and clearly communicated. The property is very well managed and cared for. The architect was amazing too and definitely valued interesting and engaging grounds as well as a fascinatingly designed manse. The interior is cooler than the pics give it credit for. It is literally a human created sandcastle for humans. Every child&rsquo;s dream. You will probably want a car if you plan to go out for food and drink. There is a caf&eacute; next door with live music from 1-4pm Wednesday-Saturday, otherwise you are on your own in a secluded area of the beach, which is filled with beautiful sea glass. It&rsquo;s nice to be off the beaten path a bit, but Rafael can help arrange transportation and other activities if you need help organizing and planning outings. Overall, I highly recommend this place! We&rsquo;re planning to be back within the year! We went to Mazatlan to have a family Christmas away. There are 4 &quot;apartments&quot; and layout was perfect as you could all be together or have your own separate space. The property was clean and fairly well maintained. Any issues that came up were dealt with quickly and efficiently. The pool was wonderful and the outdoor spaces were very welcoming. I would recommend this property to family or friends! Thank you for providing us with an amazing space to celebrate our family Christmas!